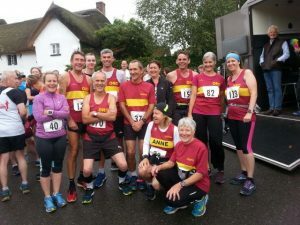 Once again Okehampton Running Club members have been travelling far and wide to take part in races from France to Scotland. Bristol was the former home of two ORCs who returned there on Sunday to run the Bristol Half Marathon. Karen King and Abby Williams set out to enjoy their run on home turf and raise money for the Make-A-Wish Foundation, a charity close to Karen’s dad’s heart. With the departure of the rain, the near perfect conditions and support from their families helped them to produce a great run to finish in 1.49.14 a PB for Karen and Abby’s first race since 2015! Jason Ewing feels very much at home in Bristol, spending much of his working life there and ran the race for the third consecutive year, finishing in 1.38.18 to set a new PB. Another ORC, Rachael Hayden, also ran for charity here, choosing to raise money for Macmillan Cancer Support, and coming home in 2.17.57. For two ORC’s a visit to Disneyland Paris was to take part in one of their themed weekends of races, this year’s theme being Disney villains. Starting with a 5k on Friday, followed by a 10k on Saturday, they run a half marathon on the final day. The courses are through the Disney Parks with plenty of Disney characters to pass en route, at the end of which the rewards are huge medals and colourful T shirts. 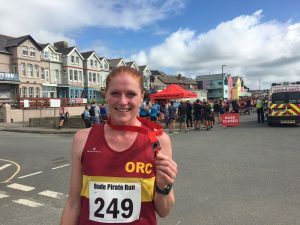 Okehampton’s Nicola Leach already has a set of these medals from her trip here last year, but for Jo Page this was her first experience of these magical races with five medals up for grabs on completion of the three races. The 5k and 10k races aren’t timed but the Half Marathon is and both ORCs were very happy with their times. Jo Page ran an incredible race, starting in the second to last pen and crossing the start 45mins after the gun went, she stormed her way past over 7,000 runners, round a very twisting and turning course, finishing in 1.37.51 to be 7th senior lady and knock 10 mins off her previous PB. Nicola hasn’t been running much recently while training for her nursing degree but was pleased to improve on last year’s time to finish in 2.13.23. 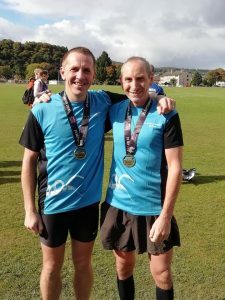 Scotland was the destination for ORCs Roger Voaden and Geoff Hill to run the Lochness Marathon. Geoff has completed this race twice before, but for Roger this was his first time round this very scenic course that follows the Loch’s south eastern shore and then along the River Ness into the centre of Inverness. On a day of sunshine and showers the views beside the Loch were stunning and Roger completed his 90th marathon in 3.10.09 while Geoff had another run hampered by training problems, finishing in 3.33.19, just over a minute slower than last year. Nearer home the War Horse 10k was a completely new race, marking 100 years since the Armistice and starting in the pretty village of Iddesleigh, home of the War Horse author Michael Morpurgo. There was a great turnout from Okehampton with thirteen runners taking part, all enjoying the route through quiet country lanes in the sunshine that followed the clearance of the rain just before the start. First home for the club was a relatively new member, Stephen Sincock, who has done very little running leading up to this race but certainly pulled it out of the bag to finish in 44.06, coming sixth overall and First Male Vet. The first ORC lady home was Lucinda Walsh, running her first ever race to come home in a great time of 58.14. Christian Davies, one of the club’s junior runners, enjoyed his first 10k with an impressive run to claim the First Junior prize in a time of 48.09, while Jo Drew completed her first 10k race in 1.13.21. Other ORC times; Alec Robinson; 46.31, John Binns; 50.52, Phil Reed; 51.49, Richard Jones; 59.23, Paul Evison; 1.01.16, Ruth Bushell; 1.06.03, Anne Binns; 1.08.11, Mary Carol De Zutter; 1.11.35, Janet White; 1.13.21. The aptly named Bovey Beauty had only one club member, Rob Hicks, representing the club this year. This tough fell race across some of the more remote areas of East Dartmoor National Nature Reserve has spectacular scenery and attracts more runners every year with a record entry again this year. The rain cleared before the start to give good running conditions but leaving it wet and slippery underfoot. Rob ran well, staying with the leader and eventual winner over the more technical and hilly first half of the race but dropping down in the later stages to finish third in 1.19.00, a course PB of three minutes for him and just a couple of minutes behind the winner who set a new course record. For one Okehampton runner, Emma Dean, the rain was very much present throughout her race the Lanhydrock 10. This 10 mile multi terrain race through the beautiful Lanhydrock estate took place on Saturday afternoon in very wet and boggy conditions. The hilly course, largely on forestry tracks and trails and the muddy conditions did not deter Emma who thoroughly enjoyed her run, finishing in 1.27.19, an excellent time and unofficial PB for 10 miles. Another amazing run report by Jane. Thanks as always from us all. 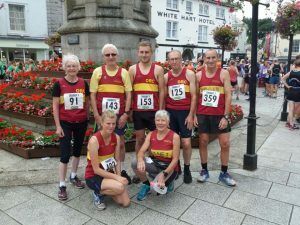 In another busy weekend of races there were some outstanding performances from Okehampton Running Club members. Saturday evening saw the the inaugural Nightjar Night Race held on the heaths around Bicton and Woodbury Common. It is named after the the nocturnal bird that returns from Africa each summer to breed on these heaths. There were two routes here, one of five miles and the other of over nine and six ORCs chose the shorter race while just one tackled the 9miles of running by head torch. Here is Jo Bradford’s report for those who didn’t see it on FB. The ORCs fielded a fast team for the inaugural Nightjar Night Race on Saturday night at 8pm. Run in the dark with head torches across uneven and varied terrain this undulating 5 Mile trail race took in pebble-bed heathland and Woodbury common, starting and finishing at Bicton Arena to receive a lovely medal. Hayden Bond set off at a rapid pace and was soon lost from sight to the rest of the field, he deservedly won the race with a stunning time of 33.36. Coming in so quickly he rather caught the race organisers off guard. Second ORC over the finish line was Jo Page with an equally impressive time of 36:00 to win the First Lady prize, casually setting a new Senior Ladies club record as an extra reward for her efforts. After spending the entire second half of the race without seeing another runner, Jo Bradford came in to take second lady overall in a time of 42:54, which earned her the First Lady Vet 40+ prize as well. The combined times of the first four ORCs home saw Hayden B, Jo P, Tom A and Jo B lift the fastest team award as an extra bonus on a night of successes for the club. Next over the line in a time of 44:28 was Karen King to take third lady overall, remarkably setting the clubs first 5 Mile record in the FV40 category in the process. After not racing for several months, the Nightjar saw the return to toeing a start line for Liam Keen, who enjoyed the race thoroughly and finishing in 53:39. The only ORC brave enough to take on the challenge of the longer, 9 Mile race was Mike Westland who crossed the line in a time of 1:33:40 and as a result won the MV category. 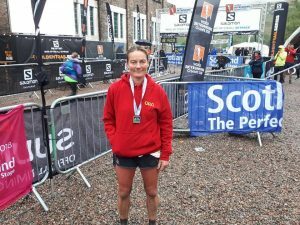 A huge challenge was undertaken by Okehampton’s Gill Spinney when she ran the Salomon Ring of Steall Skyrace in Scotland on Saturday. In the tradition of Skyrunning this race incorporates uncompromising mountain running, such as scrambling along mountain ridges with steep ascents, traverses and descents on technical and challenging terrain. This year the event hosted the World Skyrunning Championships covering three different distances, from the Vertical K, a 5k race with over 1,000m of ascent, to the 29k Ring of Steall with 2,500m of ascent and the 65k Ben Nevis Ultra with 4,000m of ascent. The race started and finished in Kinlochleven which sits at the foot of the Mamores in the coastal glen between Glencoe and GlenNevis. 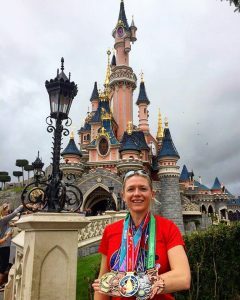 In a race packed with top international runners Gill was not over-awed by the company she was in and enjoyed the atmosphere with the streets lined with cheering crowds ringing cowbells and clapping. Her 18 mile race summited 4 Munro’s (Scottish Mountains over 3,000ft) with two ridges, including the Devil’s Ridge, a narrow track with sheer drops either side where there was a section of scrambling involved. The terrain was everything from boggy tracks at the mountain bases to scree and large rocky areas to pick her way through. Gill has long wanted to do this race and was thrilled to be a part of it this year in particular. Gill finished in a time of 8.03.03, very tired but unscathed unlike many of the runners whose wounds bore testament to the difficulty of the terrain. This was the longest race she has ever run in terms of time but Gill has vowed to return next year now she knows what she is taking on. Saturday afternoon also featured the rescheduled Yelverton 6 Moor Miles Race which had been postponed from earlier in the year due to bad weather. This is a one lap course across open moorland in the lovely surroundings of the Maristow estate and hosted by Plymouth Harriers. Five ORCs, Phil Read, Danielle Fullford Brown, Ruth Bushell, Jane Richardson and Janet White managed to make the new date and all enjoyed the good weather this time round. Times unavailable at present. On Sunday there were four ORCs taking part in the Killerton half Marathon, a tough and very hilly multi terrain race. 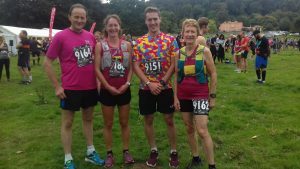 Organised by Relish Running Races in partnership with the National Trust, the course took in some of the most scenic but challenging parts of Killerton’s countryside, with nearly 2,000ft of ascent. First home for the club was George Haskell in 1.48.43 followed by Sarah Marvin who had a fantastic run, improving on her time last year by 16mins to finish in 1.53.46, coming third lady overall and first in her age category. Mags Jarvis was pleased to finish inside her target time of 2hours 30 by finishing in 2.27.52 to come 2nd W60+. Richard Jones had entered the race some months ago, but due to lack of training he pulled out after the first 11k. Thanks to Jane for pulling together the report and to everyone who sends in some great text to makes Janes reporting some much easier. thanks everyone and well done. French quarter and all the usual stuff! 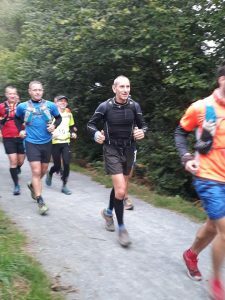 Okehampton Running Club’s chairman, Jeremy Tandy, completed a massive challenge and tested his endurance last week by running the Pyrenees Stage Run. This multi-day event is a seven stage race, starting a week last Sunday in Ribes de Freser and finishing last Saturday in Salardu. It is run by teams of two or three competitors for safety and for the experience of sharing this incredible adventure. The distance and ascent of each day varied, with the longest day being over 30 miles, but the total distance for the race is 150 miles, while the total ascent is an incredible 15,000 metres. The tough routes made it possible to be climbing over 1,200 ft of ascent with each mile in places, but the stunning scenery was at its best with most days being blessed by sunshine. This was Jeremy’s first taste of Ultra running and was a huge achievement, having run a total of 49hr 04min 03 sec by the end. Last Tuesday evening three ORCs took part in the last of the Run Exe 5k summer series. These races are held once a month from April to September and the final prizes are awarded for the best four runs out of the six. Jo Page, Jo Bradford and Andrew Vernon were the three to take part this month and all three ran brilliantly. First home of the trio was Andrew Vernon, running a season’s best of 18.49 to be third in his age category for that race. Jo Page was next going under 21minutes for the first time and setting a new senior ladies club record of 20.52 to also be third in her age group. Jo Bradford’s time of 23.12 put her second in the FV45 group for that race, but meant she was the overall winner of that category for the series. Another Summer series finished on Wednesday evening, this being Okehampton’s own Summer Race Series, with the final race being the Sourton Tor Race. This is a typical up and down fell race of only 2.6 miles, starting and finishing at the Bearslake Inn, Lake. Despite the short distance this lovely little race draws runners from far afield who love the relaxed atmosphere and fun that the course provides with its steep uphill climb and fast downhill finish. With runners coming from as far away as Peterborough, Truro,Taunton and even Sheffield, the race was won for the third year running by Toby Chapman from Bournemouth AC. First home for Okehampton was Paul Crease in 4th place in 20.31 with his Ben Nevis race not fully out of his legs. Next was Roger Voaden, having a warm up for his weekend ultra marathon in 22.28. Christine Fritsch was the first ORC lady finishing in 29.40, and Angus Farrelly was next in 30.54 with Janet White in 39.45. Sarah Marvin had a great run at the Exeter Riverside Parkrun on Saturday morning where she set a new PB and a new Vet45 ladies club record in a stunning time of 20.53. 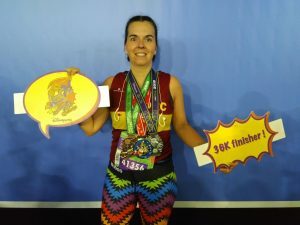 She has been improving her 5k times recently and this run knocked another 18 seconds off the record she only set at the beginning of August. Roger Voaden ticked off another marathon in his quest to reach 100 by running the Dartmoor in a Day ultra on Saturday. Although not really a race, more of a challenge Roger still made sure he came in joint first after 6 hours of running. 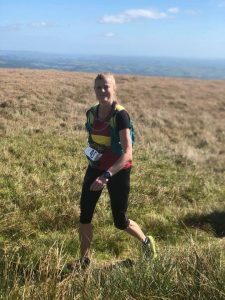 For those racing this weekend Sunday turned out to be a glorious day and this was very much appreciated by Christine Fritsch who took part in the Dartmoor Volcano race. This is a 10.5 mile trail race over rough moorland tracks with almost 500metres of ascent, visiting South Dartmoor’s highest point – Ryders Hill before reaching the focal point of the race, the Red Lake Volcano. Of course this never was a real volcano and is actually a spoil heap from the Red Lake china clay works which were abandoned in the 1930′s but has the appearance of a volcanic cone. Christine didn’t have a great race but still enjoyed the stunning scenery, finishing in 2.10.56. Beautiful scenery was also to be found on the coast where Emma Dean ran the Bude Pirate Run. This picturesque route has just over 8 miles of woods, trails and coastline with plenty of hills, starting and finishing outside Tommy Jack’s Beach Bar in Bude. Emma thoroughly enjoyed this tough but scenic race, finishing in 1.14.19. Many thanks to Jane for gathering all the news this week and all weeks. Dartmoor Highground and loads more! Last weekend saw Okehampton Running Club members take part in races from Cornwall up to the Scottish Highlands. 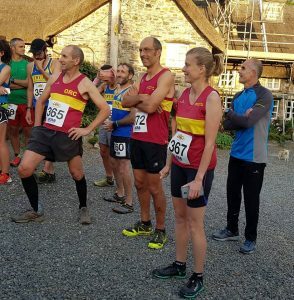 On Saturday the focus was very local, with Dartmoor Highground holding its trio of races, the Dartmoor 50, Dartmoor Marathon and ten mile Yes Tor races all of which start and finish in Simmons Park. All the routes were fully marked so there was no need for self-navigation. The conditions were good with just enough breeze on the moors to help cool the runners, and the ground still pretty dry. 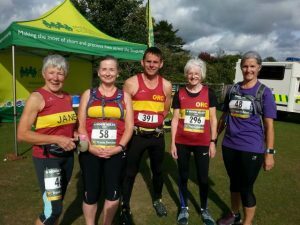 With one ORC running the Ultra and three running the marathon there was plenty of opportunity for club supporters to get out on the course and see runners at various points. The Ultra runners set off at 6.00am and after a first visit to Yes Tor they then complete a loop on the eastern side of the moors including Cosdon Hill, Steeperton Tor and Hangingstone Hill, before heading back via Oke Tor and East Mill Tor to climb up to High Willhays. From here the route largely follows that of the marathon course, taking them to Kitty Tor, and Great Links Tor before there is a welcome checkpoint and feed station at Nodden Gate. As the name Highground implies the runners were sent over the top of all these high points, often by the steepest routes while our runners frustratingly knew of gentler ascents and better paths. After a steep ascent of Branscombe’s Loaf the marathoners drop down to Meldon reservoir and another checkpoint while the Ultra runners stay up high and go back to the moor to rejoin the other route later. After another visit to Yes Tor both routes head back to the finish but not before climbing over West Mill and Rowtor. Even the finish has a cruel twist in that after crossing Kempley Bridge into the playing fields the runners have to run around the edge whilst being able to see the finish to their right. First home for the club in the Marathon was Katie Littlejohns with a brilliantly paced and superbly run race to come home First Lady in a time of 5.05.19. She had run much of the race with Mike Baker, but pushed on after Meldon checkpoint with the knowledge that the leading lady was not far ahead of her and finished strongly after passing her rival at West Mill. Mike also had a great run, putting to bed the “Did Not Finish” demons of his run last year when he did not pace his run so well, coming home in 5.41.00. New member Lucian Flynn was the third ORC in the marathon and had chosen this as his first marathon, doing very well to complete such a tough one. The 50 miler was the first time Robert Richards had attempted such a long distance, having completed a 34 mile ultra in Dorset in July. He had a mixed race with some very low points and some parts where he felt good, but despite feeling unwell at the halfway checkpoint he rested and recovered to push on again. He was very relieved and immensely pleased to finally finish in 15hr 20min 20sec. Despite his tiredness his final run in from Rowtor, Culver steps and the East Okement Valley, Robert filled with adrenalin with the knowledge he had succeeded ran in to the finish very strongly, to be greeted by a large contingent of ORC runners who waited patiently to see him finish. 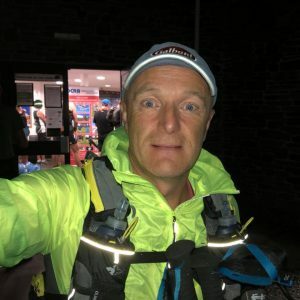 While the Dartmoor Marathon had an elevation gain of 4,900ft over the 26 miles, ORC Paul Crease achieved nearly this elevation over a mere 9 mile race the same day when he took part in the iconic Ben Nevis race in Scotland. Due to the seriousness of the mountain environment and the difficulty of the race, entry is restricted to those who have completed three category ‘A’ hill races. After a 2,000ft scramble to the summit, Paul was hoping for a good descent, being very strong and fast at this part of any fell race, however he was amazed at the speed some of the top runners went down. Paul held his own though and even passed some until he had a fall off the edge of the path, skidding several metres down the mountainside which luckily resulted in nothing more serious than losing some skin from his shin. He decided to ease up a little for safety but still finished in a very good time of 2.00.42, having done Okehampton and himself proud in such company and in what is an incredibly tough race. Jackie Dawes was the only other ORC to run on Saturday, taking part in the Dartmouth Regatta Road Race. This 5.1 mile race starts and finishes on the South Embankment and follows a very hilly route but with beautiful views of the coast and estuary. On a hot day Jackie was pleased to finish in 45.20 to be second in her age category. Sunday saw two more races where club runners were testing them selves. Three ORCs, Hugh Robinson, Paul Carter and Rob Kelly, were in need of a half marathon race as part of their Barnstaple marathon training and so made the trip up the M5 to Bridgewater. The race sets out from Moragian’s Rugby Club and heads east across the Somerset levels. The pan flat first few miles were punctuated by some gently undulating hills before heading back along the same route via a small out and back section. Rob and Paul set out quickly with Paul paying a little for his early exuberance towards the end of the race, being passed by Hugh along the way. First home with the Coe group bragging rights was Rob in an impressive 1:22:17 to come home in 13th place. Hugh made up a good number of places in the back half of the race to get 17th in 1:24:08 whilst Paul won the “Super vets” category only just behind Hugh, taking 19th overall in 1:24:51. 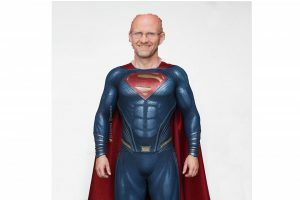 In a travesty of justice the Super Vet winner didn’t get a prize; Hugh and Rob and currently starting a crowd sourcing campaign to rectify this and buy Paul a pint or two! Nearer home the Treggy 7 had its usual good representation of Okehampton runners with seven members setting out from Launceston Town Square on the seven mile circular course. The route is along undulating rural roads with a long climb to the village of Tregadillett after which the last 3 miles are mainly downhill and a fantastic finish line in the grounds of Launceston Castle. First home for the club was Roger Voaden in a time of 46.53 with Christine Fritsch first of the ladies in 1.04.36. Other ORC times; Hayden Bond, 47.00, Andrew Vernon; 47.41, Ged Fitzgibbon; 1.01.00, Jane Richardson; 1.15.50, Janet White; 1.22.53. 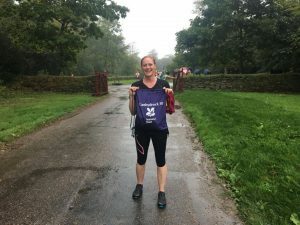 Last Monday Okehampton’s Christine Fritsch took part in the Lustleigh Fair 10k, which forms part of the very traditional Lustleigh Village Show. This race is always held on August Bank Holiday Monday and is quite a tough multi terrain course, although with too much road for Christine. She still enjoyed the off-road sections, finishing in 1.03.30. Thank you as always to Jane for the gathering and editing of this report, plus further thanks to Hugh Robinson who took the time to prepare the Bridgwater part of the report. Error: Error validating access token: Session has expired on Saturday, 20-Apr-19 03:20:42 PDT. The current time is Monday, 22-Apr-19 11:26:25 PDT.